April is National Poetry Month and I thought to myself how fun its the largest literary celebration in the world. Everyone one can take time to appreciate poets marking poetry’s important place in our culture and our lives. I love poetry and even wrote a book. For National Poetry month I am sharing poetry Military Spouses everywhere can enjoy. Poems are little glimpse into extraordinary minds sharing just enough to create a world far beyond our every day life. Narrative- tells a story or event with a poem. Haiku – is an ancient Asian form of writing a poem using precise punctuation with just three lines. Limerick – is a witty fun five line poem using distinctive rhythm. Free Verse – are poems that do not follow any rules and is creatively created by the author. Sonnet – is a short poem that rhymes and is only fourteen lines long. Epic – is a long narrative poem that celebrates adventures of a hero. Poetry is so wonderful because its quick and to the point. Sometimes life gets tough and sometimes you don’t know where to turn. I feel poetry can uplift and inspire anyone. DYI: Print out your favorite poem and frame it. Hang it or display it at home or work where you can read it when you need that extra push of motivation or encouragement. If a find a poem that you can read over and over again that helps you get through hard times. There are so many poetry books available today. Remember April 28th : It’s National Great Poetry Reading Day get ready to read your favorite poetry to take part! 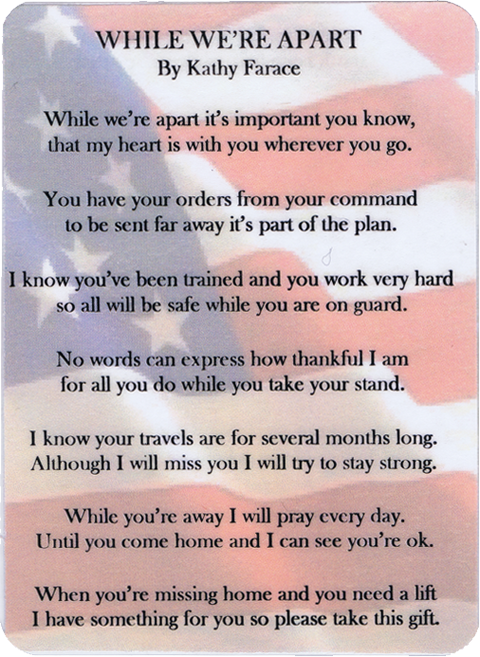 I will leave you with some heartwarming Military Spouse Poetry! What is your favorite Military Spouse Poem? What poetry inspires you? Leave a comment and share your thoughts!